Alex Lange went 10–0 with a 2.11 ERA and 91 strikeouts in 81 innings for LSU, which is the No. 2 overall team in the tournament. The Road To Omaha begins on Friday, as 64 teams compete for college baseball's ultimate prize. Here are five things to watch out for as this year's NCAA tournament gets set to kick off. The Road To Omaha is about to begin. On Friday, 64 teams will start the quest for a championship in the NCAA baseball tournament. Last year, Vanderbilt collected its first title in school history by defeating Virginia. This year, the Commodores return to the fray, but they'll have plenty of competition from the likes of No. 1 overall seed UCLA and No. 2 LSU, which finished the season as Baseball America's top-ranked team in the country. A quick refresher on the tournament's format: The 64 teams will be divided into 16 four-team regionals, which function as double-elimination tournaments. The winners advance to the Super Regionals, where they will play in head-to-head, best-of-three series over the first full weekend in June to determine the eight teams who will compete in the College World Series, which starts on June 13 in Omaha. With the field set and the teams matched up, here are five things to look for before the tournament begins. The selection committee has set things up so that we have some intense, local rivalries in the four-team regionals. Already, you have potential matchups between UCLA and Cal State-Bakersfield; LSU against in-state rival Tulane; No. 4 seed Florida facing Florida Atlantic; Illinois taking on Notre Dame; UC Santa Barbara against USC; Dallas Baptist facing Texas; and Oklahoma State versus Oral Roberts. It will take some things falling into place, but the stage is set for some great regional finals. The committee never has an easy job in selecting this field or in deciding after such a long season which teams are most deserving of hosting regionals. That said, a few schools can’t be pleased. Right away, consider that UCLA received the No. 1 seed over LSU despite losing two of three to Oregon to conclude the season while the Tigers won two of three in the SEC Tournament. How about Michigan State being on the outside looking in despite sweeping Oregon and beating Clemson? The Spartans also rank 48th in RPI. And then there’s North Carolina— a team that looked like a sure bet to make the tournament for the 15th year in a row—not getting a bid. Instead, Clemson, a team with a lower RPI than the Tar Heels, is in the field. Radford, a Virginia school of 9,900 students, will make its first-ever tournament appearance after winning the Big South Conference. The Highlanders, who are the No. 2 seed in the regional hosted by Vanderbilt, enter the tourney on a 15-game win streak and have won 35 of their last 39 games overall. Radford shouldn't be overlooked: The Highlanders hit .294 as a team and have an ace in junior lefthander Michael Boyle (10–2, 2.27 ERA in 99 1/3 innings). Another school to watch out for is Big East champion St. John’s, which will be playing its opener against Oklahoma State in Stillwater. The Red Storm, who are on a 15-game win streak, are led by Ryan McCormick, the Big East Pitcher of the Year. He displayed his talent and grit in the Big East Tournament, tossing a complete game to beat Creighton, then coming back two days later to record the save, also against the Jays, as St. John’s captured the league title. St. John’s is one of three New York teams in the field, joining Ivy League champion Columbia and America East champion Stony Brook, who made it to the College World Series in 2012. The smallest school with a chance to make some history is Dallas Baptist, a university of 5,400 students and the team with the highest RPI in the nation. The Patriots (43–13) did not win either the Missouri Valley Conference regular season or the postseason tournament, but were ranked in the national top 10 for most of the season while playing a demanding schedule. 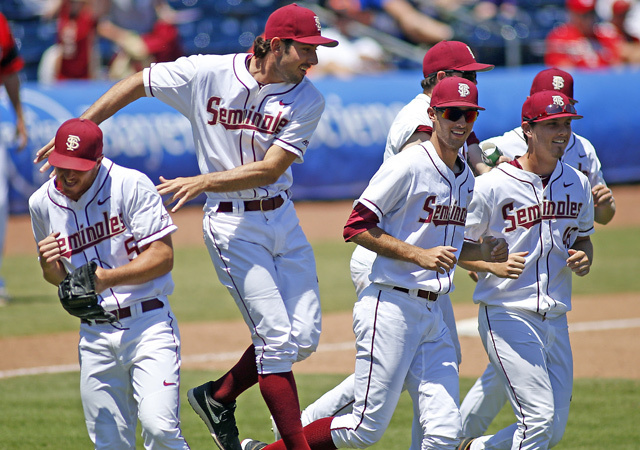 Florida State is one of seven ACC schools to receive a tournament bid and is a No. 1 seed in its regional. It’s a story every June: the ACC trying to crown its first College World Series champion since Wake Forest won it all back in 1955. But if it happens this year, it’s likely to be one of the conference’s “new additions,” and not one of its old school participants, who will take home the title. Leading the way for the ACC are Miami, Louisville and Florida State, who all garnered top seeds and will host regionals. North Carolina State and Notre Dame earned No. 2 seeds, while last year's runner-up, Virginia, made the field as a No. 3 seed. Maryland, making its second straight appearance in the NCAA tournament, is also a No. 3 seed, but the Terrapins are now a member of the Big 10, so their chance to end the ACC drought came and went a year ago. When UCLA won the College World Series in 2013, it did so with lights-out pitching. It should come as no surprise, then, that this year’s Bruins are cut in the same mold. UCLA leads the nation in ERA (2.16) and WHIP (1.05) and has a closer in David Berg (48 career saves) who knows what it’s like to pitch in big games, having handled closing duties during the team's championship run two years ago. Vanderbilt is also built on power arms, entering the tournament as the national leader in strikeouts per nine innings (9.7). The Commodores are led by righthander Carson Fulmer, who could be the No. 1 pick in June's MLB draft. Opponents are hitting just .197 against Fulmer this year, and he’s struck out 136 in 100 1/3 innings. Behind Fulmer is lefthander Philip Pfeifer, who missed all of 2014 for failing to meet “team standards” but has worked his way from the bullpen into a starting role and has struck out 91 batters in 71 innings. Vanderbilt coach Tim Corbin has a number of weapons in his bullpen, which means any team hoping to beat the Commodores had best be leading by the sixth inning. Other teams that could pitch their way to a title include TCU (2.33 ERA) and UC Santa Barbara (2.39). Cal State-Fullerton’s staff is another one to watch, as the Titans' rotation has a strikeout-to-walk ratio of nearly five to go with nine shutouts this year, a number matched in the field only by UCLA, Tulane, TCU and Missouri State. The leader in shutouts is Vandy with 11, followed by Southern Miss (10). 5. The return of the long ball? While it’s still unlikely we will see a lot of balls flying out of cavernous TD Ameritrade Park in Omaha, we should see plenty of long balls in the action leading up to the CWS. Last year, only four teams averaged more than one home run per game, but this year, 18 teams went deep more than once per game. What's behind the increase? Perhaps it's the switch to a flat-seam baseball that allowed for less drag and more carry on fly balls. Case in point is Dansby Swanson, Vanderbilt’s star shortstop, who hit three home runs as a sophomore but has 13 as a junior. Swanson is one of three Commodores to hit double-figure home runs this year; the leader on last season’s national championship team was Zander Wiel, with five.